Department of Quality Assurance, Dr. Bhanuben Nanavati College of Pharmacy, Vile Parle (West), Mumbai - 400052, Maharashtra, India. ABSTRACT: The present manuscript describes a new simple, specific, precise and accurate RP-HPLC development and subsequent validation for simultaneous estimation of Pyrantel pamoate and Febantel in their combined dosage form. The proposed method involves the utilization of a hypersil BDS C18 (150 × 4.6 mm, 5 µ) column, mobile phase containing acetonitrile: phosphate buffer in the ratio 85:15% v/v and 55:45% v/v with apparent pH adjusted and maintained to 3.5 using 0.01M orthophosphoric acid, pumped at a flow rate of 1.0 ml/min. The injection volume was 20 µl, and detection was monitored at 286 nm. The components were eluted by gradient mode. The peaks obtained were sharp and well resolved with retention times 4.5 min (Pyrantel pamoate) and 6.5 min (Febantel). The calibration curves were linear (r2=0.999) over the concentration range of 25-150 µg/mL for Pyrantel pamoate and Febantel both. Validations of the proposed method were carried out for its accuracy, precision, linearity, robustness LOD and LOQ according to ICH Q2 R1 guidelines. The statistical analysis was carried out and the results of which were found satisfactory. Based on results, the developed method could be used for routine estimation Pyrantel pamoate and Febantel in the marketed formulation. INTRODUCTION: Helminthiasis is a parasitic disease commonly occurring in pet and domestic animals causing significant morbidity and mortality. These infections are substantial from the view of public health because the parasitic diseases are transmissible to humans affecting more than one billion population in the world 1. Owing to the narrow spectrum of anthelmintic drugs, it is needed to use combination chemotherapy to control mixed infections and to enlarge the spectrum of action 2. Two active pharmaceutical ingredients, differing in mechanism of action and spectrum of activity namely Pyrantel pamoate 15 mg and Febantel 14.4 mg present in a single dosage form as a suspension in the ratio of 1:1 were used for simultaneous estimation 3. Pyrantel pamoate, a tetrahydropyrimidine that was originally developed as a veterinary anthelmintic for the treatment of hookworms, pinworm, roundworms (ascaris) in humans and domesticated animals such as horses, cattle, sheep, pigs, cats, dogs and also in Trichostrongylus orientalis infections 4, 5. It acts on the cholinergic receptors of the parasite resulting in spastic paralysis, i.e. peristaltic action of the intestinal tract then the parasite is eliminated through feces 3. Febantel acts as a prodrug against nematode parasites including whipworms. After transformation to fenbendazole, it binds to tubulin which is a structural protein of microtubules which are involved in motility, division and secretion processes of cells in all living organisms. In the worms, blocking of these microtubules perturbs the glucose uptake which eventually empties the glycogen reserves, leading to the blockage of the whole energy management mechanism of the worms. This causes paralysis and death of the worms causing them to be expelled through feces of the animal 6, 7. 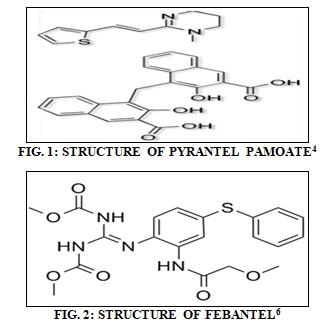 Literature survey reveals a few spectrophotometric and chromatographic methods for the estimation of Pyrantel pamoate as a single component and Pyrantel pamoate and Febantel in combination with other drugs 1, 2, 3, 8, 9, 10. However, none of these techniques monitor this combination simultaneously or present adequate sensibility or selectivity so far. The objective of the present communication is to develop a simple, rapid and precise chromatographic method for the determination of Pyrantel pamoate and Febantel in an oral dosage form and to validate the method as per ICH Q2 R1/USP guidelines 11. Chemicals and Reagents: Pyrantel pamoate was obtained as a generous gift sample from IPCA Laboratories, Mumbai and Febantel were purchased from Pure Chem. Pharma Pvt. Ltd., Veterinary anthelmintic formulation worex was purchased from local pharmacy 12. All chemicals and reagents used were of HPLC and analytical grade procured from S.D Fine Chemicals Ltd. Distilled water generated from a Millipore water purification system was used throughout the study. Equipment: Chromatographic separation was carried out using HPLC system (Agilent 1260 series) containing a photodiode array detector. The output signal was monitored and processed using Open Lab Control Panel software. UV spectro-photometer used was from Shimadzu, UV- 3000. Preparation of Standard Solution: 50 mg of standard / pure drugs/ API - Pyrantel pamoate and Febantel were accurately weighed and transferred to a 100 ml volumetric flask separately and dissolved in 50 ml methanol. The flasks were shaken and sonicated for 10 min after complete dissolution of the API; volume was made up to the mark with methanol to give a solution of concentration 50 g/mL each. From each API solution, 10 ml was withdrawn and diluted up to 100 ml with the mobile phase to give a solution of 5g/mL of each Pyrantel pamoate and Febantel. Preparation of Sample Solution: Sample quantitatively equivalent to 15 mg of Febantel and 14.4 mg of Pyrantel pamoate was weighed accurately and transferred to 100 ml amber colored volumetric flask. 70 ml of methanol was added, shaken well, sonicated for 25 min and diluted up to the mark using methanol. 1 ml of filtrate was diluted to 10 ml with the mobile phase. HPLC Analytical Conditions: To develop the method, several trials were conducted using different diluents/solvents. Varying concentrations of the drugs were injected at their detection wavelength for simultaneous estimation using different mobile phase combinations and compositions to optimize the method. Selection of Detection Wavelength: The standard solutions of Pyrantel pamoate and Febantel were scanned individually over a range of 200-400 nm wavelength on Shimadzu’s UV spectrophotometer. It was observed that the wavelength for Pyrantel pamoate was 286 nm and Febantel was 281 nm. Hence, the wavelength 286 nm was selected for the determination of Pyrantel pamoate and Febantel simultaneously. Selection of Column: For HPLC, numerous columns are available but C18 column was preferred over other columns. Hypersil BDS C18 column 250 mm length 4.6 mm as internal diameter having a particle size of 5µ was chosen to give good peak shape and high resolution of the components. Selection of Mobile Phase: The mobile phase was selected by best isolation of components, peak purity index, peak symmetry, and theoretical plates. Trials were carried out with solvents like water, acetonitrile, phosphate buffer and methanol with varying composition and combination. Solvents were filtered through 0.45 membrane filter paper and sonicated for 5 min. Selection of pH: Depending on log P and pKa value of the two drugs, pH was selected and adjusted using dilute or 1% orthophosphoric acid and triethylamine. Buffer Preparation: Phosphate buffer of 50 mM strength was prepared by accurately weighing 6.8 g of potassium dihydrogen phosphate in 1L of volumetric flask, added 900 ml HPLC grade / Millipore grade water and degassed to sonicate and finally made up the volume with water. The pH was adjusted to the required value with dilute orthophosphoric acid using digital pH meter. Selection of Column Temperature: The column temperature 30 ºC has minimized variation of retention and made the peak sharp. It also shortened the run time. Validation of RP-HPLC Method: As per ICH Q2 R1 guidelines, the method validation parameters checked were linearity and range, LOD, LOQ, accuracy, precision, robustness and specificity 11. Linearity and Range: Appropriate aliquots of Pyrantel pamoate and Febantel working standard solutions were taken in different 10 ml volumetric flasks and diluted up to the mark with mobile phase to obtain final concentrations of 25, 50, 75, 100, 125 and 150 μg/mL of Pyrantel pamoate and Febantel each. Chromatograms were recorded. Calibration curves were constructed by plotting peak area versus concentration, and regression equations were computed for both the drugs. The correlation coefficient value of Pyrantel pamoate was found to be 0.999 and Febantel was 0.995, and the equation for regression line was y=53734x+ 12399 for Pyrantel pamoate and y=36047x+23942 for Febantel. The results show that an excellent correlation exists between the response factor and the concentration of drugs within the concentration range stated above. Where, σ = the standard deviation of the response S = the slope of the Calibration curve. Accuracy: The accuracy of an analytical method expresses the nearness between the reference value and experimental value. The accuracy of the method was evaluated in triplicate at three concentration levels, i.e., 80%, 100%, and 120% and the percentage recovery was calculated and presented in Table 4. The results obtained accurately fall within the limit of acceptance criteria. Precision: The precision of an analytical method gives information on random error. It agrees to a series of measurements obtained from multiple sampling of the same homogeneous sample under prescribed conditions. The percentage RSD values for the precision study was 0.237%, 1.69% (intra-day precision) and 0.437%, 1.491% (inter-day precision) for Pyrantel pamoate and Febantel, respectively. This is confirming good precision of the method. The results are summarized in Table 5. Robustness: The robustness of a method is its capacity to remain unaffected by small changes in chromatographic condition. To determine the robustness of the method, the experimental condition, i.e. pH of mobile phase was deliberately altered and system suitability parameter like relative standard deviation for replicate injections of Pyrantel pamoate and Febantel peaks were evaluated. Specificity: No peaks were observed at the retention time of both the drugs; hence, it complies with acceptance criteria. CONCLUSION: From the results obtained, it is obvious that the proposed method is applicable for the determination of Pyrantel pamoate and Febantel without interference and with good sensitivity. The method was validated entirely showing adequate data for all the method validation parameters tested proving it to be specific, rapid, linear, accurate, precise, robust and suitable for intended use. These merits suggest the use of the proposed method in routine and quality control analysis of Pyrantel pamoate and Febantel without interference from commonly encountered excipients and additives. ACKNOWLEDGEMENT: The authors are grateful to Dr. Bhanuben Nanavati College of Pharmacy, Mumbai and to the laboratory assistance for providing facilities to carry out the research work and would also like to extend gratitude to IPCA Pharmaceuticals and Pure Chem Pharma Pvt. Ltd. for providing gift samples of the drugs. Pontes FLD, Pontarolo R, Campos FR, Gasparetto JC, Cardoso MA, Piantavini MS and Trindade ACLB: Development and validation of an HPLC-MS/MS method for simultaneous determination of Ivermectin, Febantel, Praziquantel, Pyrantel pamoate and related compounds in fixed dose combination. Asian Journal of Pharmaceutical & Clinical Research 2013; 6: 191-200. Tatar E, Ates G and Kucukguzel I: Development and validation of an RP-HPLC method for quality control Oxantel pamoate, Pyrantel pamoate and Praziquantel in tablets. Marmara Pharmaceutical Journal 2015; 19: 27-35. Sajjanwar R, Bhaskaran S, Kakati K and Jha S: Simultaneous estimation of Pyrantel pamoate, Praziquantel and Febantel by High-Performance Liquid Chromatography using dual wavelength. Journal of Applied Pharmaceutical Research 2014; 2: 32-43. Reddy JM and Ganapaty S: Development and validation of stability indicating RP-HPLC method for simultaneous estimation of Pyrantel pamoate and Albendazole in bulk and tablet dosage form. International Journal of Pharmaceutical Sciences 2015; 5: 1220-1225. Kommawar R and Nagras M: Development and validation of UV spectrophotometric area under curve (AUC) method for estimation of Pyrantel pamoate in bulk and tablet dosage form. 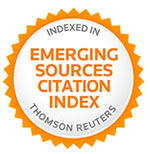 International Journal of Interdisciplinary and Multidisciplinary Studies 2014; 1: 70-76. Reddy JM and Ganapaty S: Development and validation of stability indicating RP-HPLC method for simultaneous estimation of Pyrantel pamoate and Albendazole in bulk and tablet dosage form. 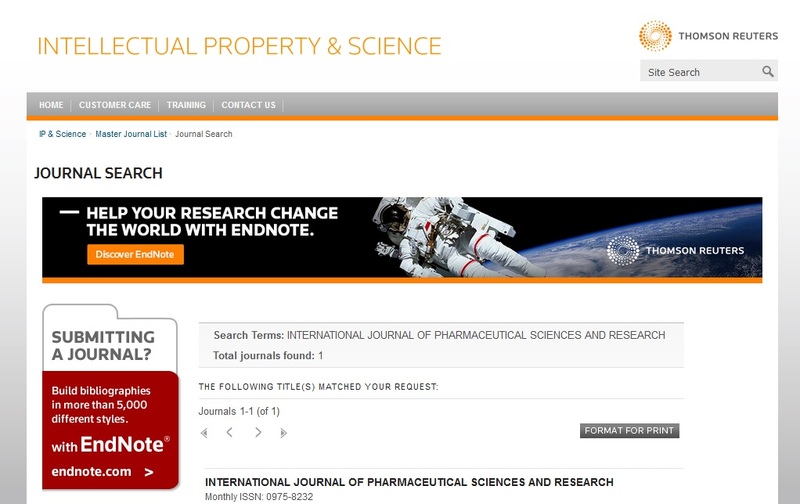 International Journal of Pharma Sciences 2015; 5: 1220-1225. ICH Harmonised Tripartite Guideline: Validation of Analytical Procedures: Text and Methodology Q2 (R1). International Conference on Harmonisation of Technical Requirements for Registration of Pharmaceuticals for Human Use, Geneva, 2005; 1-13. Tople JS, Sherje A and Mallya R: Analytical method development and validation for simultaneous determination of Pyrantel pamoate and Febantel in an oral dosage form by High Performance Liquid Chromatography (HPLC). Int J Pharm Sci & Res 2019; 10(4): 1747-52. doi: 10.13040/IJPSR.0975-8232.10(4).1747-52.